Stuart Martin with Caroline Bentham, Hazel Barker and volunteers (1803121AM1). There's no doubt about it - Ripon residents are definitely doing their bit to mark the First World War centenary, knitting and crocheting tens of thousands of poppies to create a truly spectacular display. 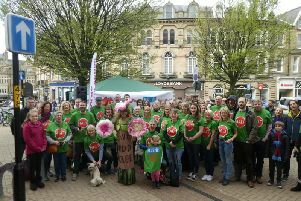 In only a matter of months, the city has embraced the project beyond what any of the organisers could have imagined - with dozens of community groups, businesses and schools all stepping up to take part. An estimated 50,000 poppies will form a visual centrepiece for Ripon's Remembrance commemorations this year, lining the route from the Spa Gardens to Ripon Cathedral. Project coordinators Stuart Martin and Hazel Barker said all of the city's 'Welcome to Ripon' signs will be decorated with poppies to greet visitors. Stuart said: "We are doing this to try and get across the message that Ripon is the place to come to commemorate Remembrance. "The community support and involvement for the poppy project has just been mind-blowing. Everybody knows somebody who has been affected or involved in one of the conflicts, so I think it's just hit a chord with so many people." Stuart and Hazel are keen to put together a display of wartime photographs, and would love to hear from any residents who have a relative that they would like to feature. There will also be a poppy open day for families at the Spa Gardens on May 26, 10am to 2pm, where children can find out more about the project and help to produce some of the displays. Ripon's secondary schools have been doing research about the city during the war, and primary schools will be taking part in a special Remembrance procession. The scale and profile of the poppy project continues to grow, with some poppies being knitted and posted to Ripon from as far as Dubai, Turkey and America. Businesses along the route from the Spa Gardens to the Cathedral have been invited to decorate their shop windows with poppies to show their support, and the response has already been very positive. To get involved with the poppy project, or to share your photographs for the Remembrance display, email Stuart Martin: bigstu.martin@virgin.net or call 07811 390448.